Senator Mike Duffy denied in court testimony Wednesday that he has ever broken Senate rules or had any motive to defraud the Senate, attempting to counter allegations that his precarious financial situation prompted him to claim inappropriate expenses. Duffy testified that when it came to claiming housing expenses on his Ottawa residence, he was instructed to do so by Conservative Senator David Tkachuk, who was a member of the internal economy committee that oversees Senate expenditures. Mike Duffy says Stephen Harper insisted he represent P.E.I. 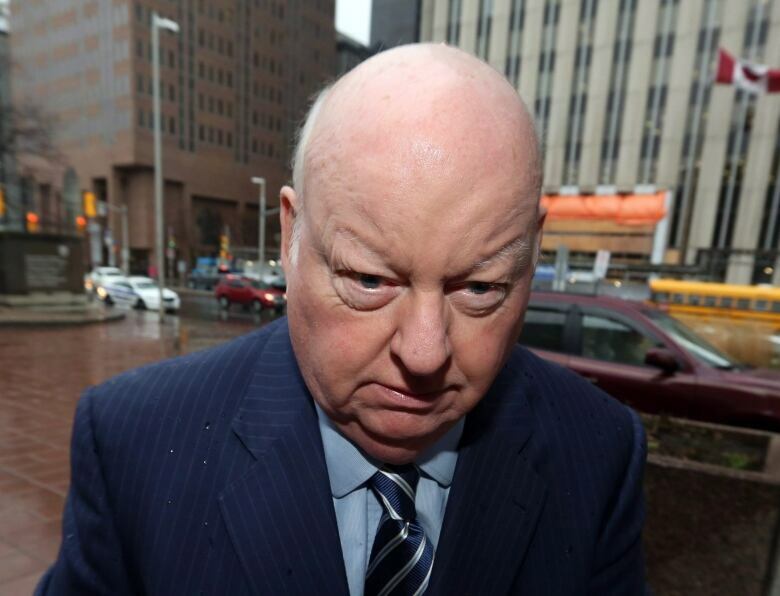 Donald Bayne, Duffy's lawyer, asked his client whether he made any of these expense claims secretly. "I made them openly, forthrightly, completely in the open and completely transparently and honestly," Duffy said. Duffy has pleaded not guilty to 31 charges of fraud, breach of trust and bribery related to expenses he claimed as a senator and later repaid in March 2013 with $90,000 from Nigel Wright, who at the time was chief of staff for Prime Minister Stephen Harper. Residency is one of the central issues in the case against Duffy. He designated his home in Prince Edward Island as his primary residence, making him eligible to claim meals and living expenses for his time in Ottawa, even though he has lived and worked in Canada's capital since the 1970s. The Crown contends that Duffy should not have been eligible for those claims. Tkachuk told him, Duffy testified, that it was "essential" that he make claims and allowances for his home in Ottawa, and that he was entitled to them. Duffy said Tkachuk told him that he didn't want Duffy to "create any light" between himself and any other senators who were making the same claims. "Even when I don't really believe in per diems," Duffy testified he said. Duffy said Tkachuk again insisted he must claim the housing allowances. On Parliament Hill today, Tkachuk remembered things differently. "I think he's talking about a briefing that we would have had with all the newly appointed senators at the time," Tkachuk said. "And I would have told them that if you 're staying here in Ottawa that you should be claiming expenses, because your primary residency is in your home province. "And if I was living here in Ottawa, and that was [my] primary residence, I shouldn't be claiming expenses." Duffy told the court that he had been concerned about a news article quoting a legal expert who said Duffy was ineligible, based on his residency, to be a senator for P.E.I. But he said he was assured by Tory senators, members of the Prime Minister's Office and Harper himself that his primary residency was P.E.I, a fact made effective once he was appointed a senator there. During the course of the trial, court heard from a forensic accountant who had testified that over a six-year period, Duffy was withdrawing more money from his bank account than he was making in deposits and that Duffy was forced to fund the difference with his line of credit. But Bayne suggested on Wednesday that his client was never strapped for cash and that Duffy and his wife, Heather, had received money from estates during that time period that totalled almost $350,000. Court also heard that Duffy's wife was receiving an income during that time. "Did you have any motive to cheat, steal or defraud the Senate or anybody else?" Duffy's lawyer asked. Under questioning by Bayne, Duffy said he has never been pressed by creditors, banks, credit card companies or the revenue agency, has never been in arrears in payment or received calls from the bank expressing concerns about his credit line. "I have never broken the rules, let alone the law," Duffy said. "I never received a penny from anyone, ever." Duffy also took another swipe at Harper, saying the former prime minister would never write in the margins of policy documents, unlike previous prime ministers. Instead, Duffy said, Harper would use yellow Post-it notes, which would later come off the documents so "there are no fingerprints." Duffy said much of the communication from Harper went through Harper's top aide Ray Novak via emails. Harper would never personally ask or tell someone to do something, except in very rare circumstances, Duffy said. "That way, he's got deniability," Duffy said. Duffy had earlier testified about a meeting he had with Harper about six months before he was asked to join the Senate. Duffy said he had been ushered into Harper's office to hear about a small error he had made on his broadcast about the public debt. Duffy said they also discussed the recent appointment of the new CBC president, Hubert Lacroix. Duffy said he asked Harper, "What's the story on him?" He said Harper said he didn't really know and that the "boys in Montreal say he's a good businessman." "And that's when I knew Stephen Harper didn't always tell the whole truth," Duffy said. He said that Harper's claim that he didn't know any details about the person running such an important news service "didn't ring true to me." Mike Duffy testifies that Stephen Harper insisted he represent P.E.I.